You are currently browsing the The Pet Product Guru blog archives for the day Saturday, June 16th, 2018. Indoor Cat, Fleas?? How Can This Happen? 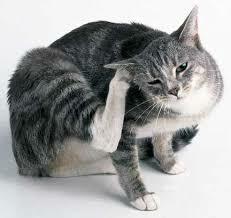 It’s not uncommon for indoor cats to become infested with fleas. How does this happen? Flea pupae or cocoons are able to do something called “over-wintering.” This means that the can go dormant and survive in the cracks in your floor or in your carpet for long periods of time. When the conditions are right, they’ll come out. They are stimulated by heat and vibration. You can actually carry the fleas into your home. You can pick up fleas where other animals have been such as your yard sidewalk or in the park. Stray cats that roam through your yard can carry fleas. Adult fleas like to stick to clothing and travel into your home with you. Other pets brought into your home by family or friends could also be another way for fleas to get into your home. When treating a house for fleas, it’s recommended that you wash all the bedding, vacuum all carpets and consider throwing away cat bedding that may be infested. You can treat areas that are infested with a spray available from your vet or you can call a professionallExterminator. Make sure that you follow the Exterminators recommendations about where to keep your cat during the extermination period. Enjoy your weekend with a great mix of diverse oldies, Edgewater Gold Radio! We play oldies from the 50s 60s 70s 80s plus add in standards and pop vocals. America’s most unique oldies station! Download the free Edgewater Gold Radio app or listen from our website, edgewatergoldradio.com. add comment Comments Off on Indoor Cat, Fleas?? How Can This Happen?